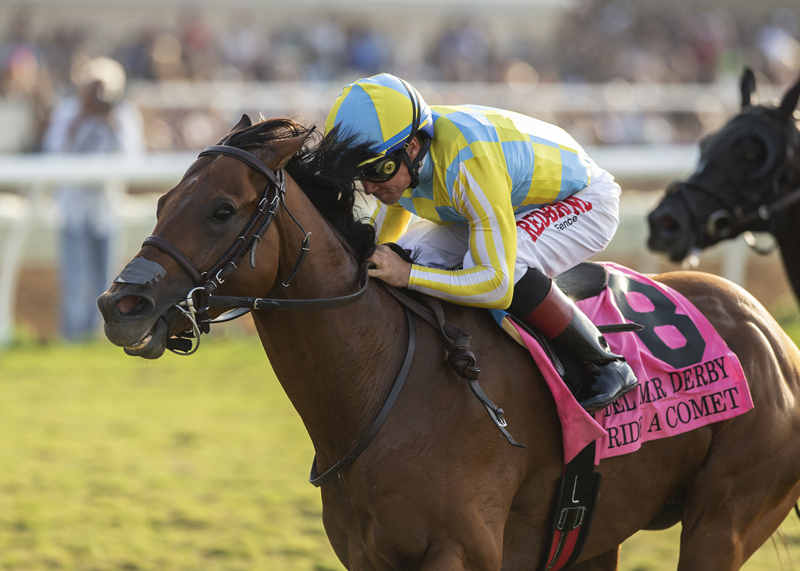 Eastern invader Ride a Comet, third in the Hall of Fame Stakes at Saratoga a month ago, made an auspicious West Coast debut Sunday with an impressive come-from-behind victory in the featured Grade II $250,000 Del Mar Derby. With leading rider Drayden Van Dyke in the saddle, Ride a Comet surged between horses entering the stretch, overhauled even-money favored River Boyne in the final furlong and pulled away convincingly to win by a length and one-half in 1:48.11 for the nine furlongs over the infield Jimmy Durante Turf Course. Kazan, a 50-1 longshot, rallied belatedly to shade La Jolla Handicap winner River Boyne by a half-length for the runner-up spot. Majestic Eagle was fourth in the field of a dozen three-year-olds. In an unusual occurrence, Animosity was declared a non-starter by the board of stewards, ruling that the filly was impeded from breaking cleanly from the gate. Ride a Comet, owned by John Oxley of Tulsa, Okla., and Leonard Riggio of New York City and trained by Mark Casse, is a son of Candy Ride bred in Kentucky. Going postward at 5-1, he returned $13.60, $7 and $4. It was his fifth win in ten outings and first money of $150,000 increased the colt’s earnings to $305,856. Second-place Kazan paid $38.20 and $12.60, while River Boyne returned $2.40 to show. In Sunday’s supporting feature, the$100,000 Del Mar Juvenile Turf for two-year-olds, 15-1 longshot King of Speed rallied from last place turning into the stretch to catch 2-1 favored Hartel in the final sixteenth and win by three-quarters of a length under Hall of Fame jockey Gary Stevens. King of Speed, a son of Jimmy Creed, entered the race as a maiden after four races. However, he had shown significant improvement when he was shifted from the main dirt track to the grass, finishing third and second. Third in the one mile race over the infield grass circuit, was Takeo Square, a half-length back of runner-up Hartel, with Forloveofcountry fourth in the field of ten. Go Daddy Go was withdrawn from the original line-up. King of Speed, owned by Del Secco DCS Inc., and trained by Jeff Bonde, was timed in 1:36.77 and returned $32.20, $9.40 and $5.80 while earning first money of $60,000. Second-place Hartel paid $4.40 and $3.20, while Takeo Squared returned $6.80. Ride a Comet was Van Dyke’s third winner of the afternoon as he opened a three-victory margin on Flavien Prat, 40-37, going into Monday’s 36th and final day of the 2018 Del Mar summer season. Prat had a double Sunday. Van Dyke apparently escaped injury in a tenth-race mishap when his mount, Toshio, swerved badly in mid-stretch, unseating the rider. Van Dyke was examined at track first aid and released and reportedly will ride Monday. DRAYDEN VAN DYKE (Ride a Comet, winner) – “They told me he was real classy and that he had a nice kick. That was all I knew (about him). He warmed up real well and gave me confidence. During the race it all came up perfect. Good trip all the way. When I swung him out he gave me a big kick. I knew right then we were going to win it. The stakes win was the (meet-leading) 10th of the session, but first in the Del Mar Derby for rider Van Dyke. He now has 21 stakes wins at Del Mar. The stakes win was the first of the meet and first in the Del Mar Derby for trainer Casse. He now has seven stakes wins at Del Mar. The winner is owned by John Oxley of Tulsa, OK, and Leonard Riggio of New York City, who races under the name of My Meadowview Farm.